Step into Ink Meets Paper’s studio and you’ll be met with an inviting blend of old and new. 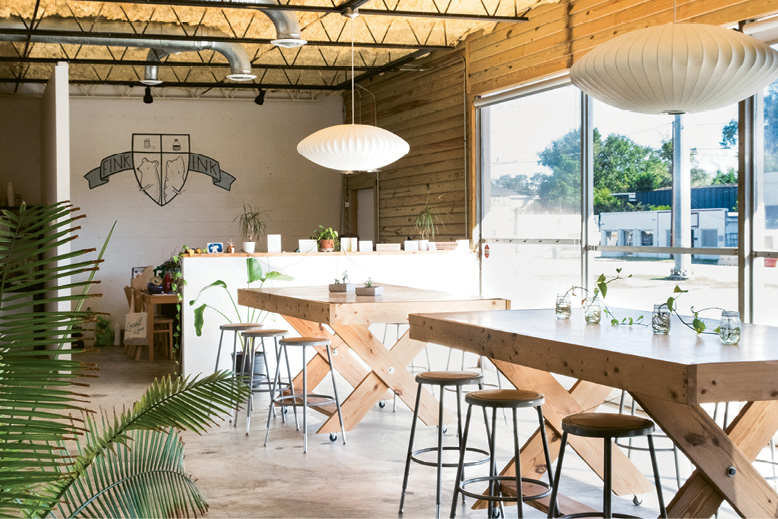 The bright, airy space is on an up-and-coming block of Spruill Avenue, decked out in trendy greenery with pop radio humming in the background. And yet the real stars here are two printing presses, dating to 1896 and 1923. 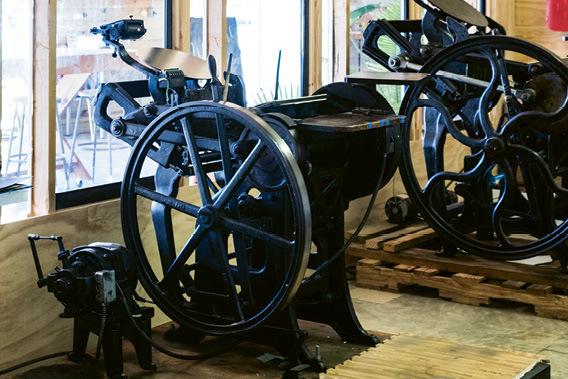 Once you’ve spotted them, it’s hard to notice anything else—the machines are arrestingly large and mechanical, and after co-owner Allison Nadeau explains the printing process, it’s clear that this operation is nothing less than a labor of love (emphasis on “labor”). 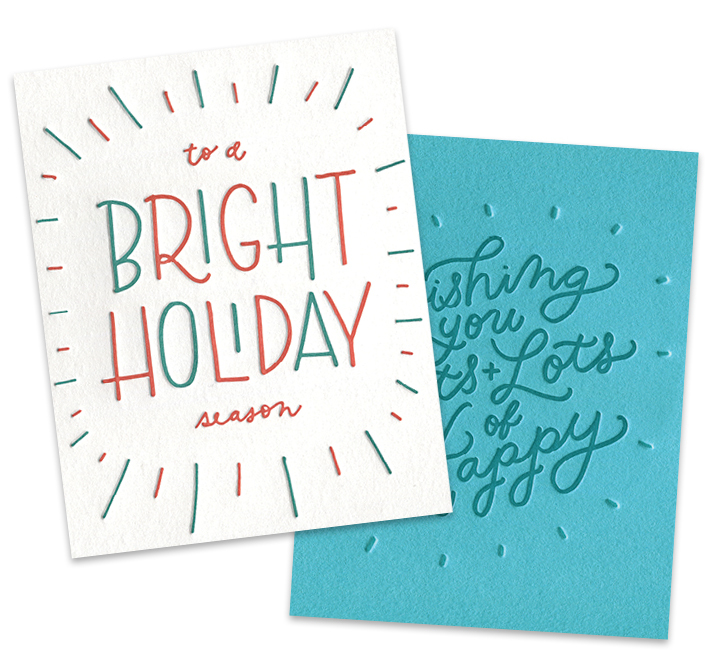 Allison and Jamie Nadeau discovered the letterpress process via a class at Redux in 2008. Completely inspired, they soon found themselves in Jacksonville, Florida, hauling off their first press from a fourth-generation printer who had recently gone digital. “He was like, ‘Y’all are crazy,’” remembers Allison. But they learned the ropes, and in 2012 made Ink Meets Paper their full-time gig. The company’s line is carried in local stores like Mac & Murphy and Candlefish, as well as by many more retailers around the country. They also offer calligraphy workshops in their studio, where students can “slow down and enjoy the process of writing,” says Allison. The behemoth presses date to 1896 and 1923. How is a modern card made on an antique machine? 1. Allison Nadeau creates pen-and-ink illustrations and lettering, then scans and digitizes the designs. 2. A partner company turns the designs into photopolymer plates. 3. Ink Meets Paper mixes ink according to formulas in the Pantone Guide. 4. They apply ink to the press’s ink disc and distribute it across the rollers, then align the plate and lock it into the press. 5. They hand-feed one sheet of paper into the machine, which presses the inked plate into the paper. 6. Each color requires a new plate and another pass through the press (steps three to five all over again).